Pizza or pizza pie is the name of an oven-baked bread usually covered with tomato sauce and cheese, and often with other toppings. While it is a typical dish of Neapolitan cuisine, it has become an extremely popular dish all over the world. Pizza was popularized in the U.S. after World War II, when returning soldiers from the Italian Front brought stories of the meal. October is the National Pizza Month in the United States. meat or seafood, such as sliced sausage, (especially pepperoni or salami), ham, bacon, ground beef, anchovies, or chicken. The crust is traditionally plain, but may also be seasoned with butter, garlic, or herbs, or stuffed with cheese. In some pizza recipes the tomato sauce is omitted (termed "white pizza"), or replaced with another sauce (usually garlic butter but sauces can also be made with spinach or onions). Pizza is normally eaten hot (typically at lunch or dinner), but leftovers are often eaten cold for breakfast or as a snack. It is famously served deep fried in batter in Scottish chip shops. Pissa is late Vulgar Latin (9th century) flat bread, and apparently came to mean a flat bread with a cheese topping by the 14th century in some Italian dialects. Many languages around the Mediterranean have similar words meaning flat bread or unleavened bread, like 'pita'. The Italian word for a person with a talent for making pizza is pizzaiolo. A restaurant that serves pizza is called a pizzeria (from Italian); the phrase "pizza parlor" is also used in the United States and Canada. 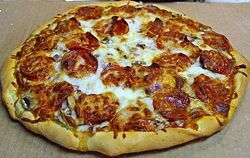 Pizza can also be purchased in grocery stores or supermarkets (usually, but not always, frozen); in many countries, pizza can also be ordered by telephone (or, increasingly, via the Web) to be delivered, hot and ready to eat, to almost any address within range of the restaurant. In the United Kingdom, pizza is a popular form of convenient take-away food often eaten at parties and other social gatherings. In ancient Greece, bread was sometimes covered with oils, herbs and cheese. The Romans developed a sheet of dough with honey and cheese toppings and flavored with bay leaves called placenta cake. Modern pizza evolved from similar flatbread dishes in Naples, Italy in the 18th or early 19th century. Before that time, flatbread was often covered with ingredients such as garlic, salt, lard, cheese, and basil. It is unknown when tomatoes were first added and there are many conflicting claims. A popular legend holds that the archetypal pizza, Pizza Margherita, was invented in 1889, when the Royal Palace of Capodimonte commissioned the Neapolitan pizzaiolo Raffaele Esposito to create a pizza in honor of the visiting Queen Margherita. Of the three different pizzas he created, the Queen strongly preferred a pie made with the colors of the Italian flag: red (tomato), green (basil), and white (mozzarella). Supposedly, this kind of pizza was then named after the Queen as "Pizza Margherita". Pizza was brought to the United States with Italian immigrants in the late nineteenth century; and first appeared in areas where Italian immigrants concentrated. The country's first pizzeria, Lombardi's, opened in 1905. Following World War II, veterans returning from the Italian Campaign after being introduced to Italy's native cuisine proved a ready market for pizza in particular. Since then pizza consumption rose dramatically in the United States. Pizza chains such as Domino's, Pizza Hut, and Papa John's, pies from take and bake pizzerias and chilled and frozen from supermarkets make pizza readily available nationwide. It is so ubiquitous that thirteen percent of the U.S. population consumes pizza on any given day. barbecue pizza, with barbecue sauce instead of the traditional tomato sauce. This page was last modified on 9 August 2017, at 11:35.